There are a variety of approved materials used in aircraft fabric covering and repair processes. In order for the items to legally be used, the FAA must approve the fabric, tapes, threads, cords, glues, dopes, sealants, coatings, thinners, additives, fungicides, rejuvenators, and paints for the manufacturer, the holder of an STC, or a field approval. 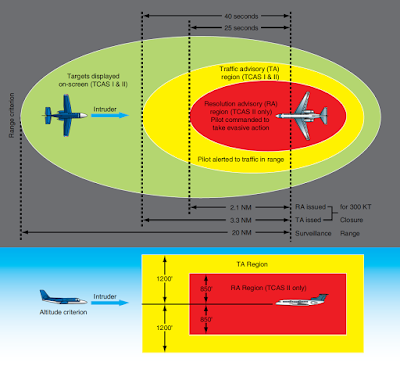 A Technical Standard Order (TSO) is a minimum performance standard issued by the FAA for specified materials, parts, processes, and appliances used on civil aircraft. For example, TSO-15d, Aircraft Fabric, Grade A, prescribes the minimum performance standards that approved aircraft fabric must meet. Fabric that meets or exceeds the TSO can be used as a covering. Fabric approved to replace Grade-A cotton, such as polyester, must meet the same criteria. TSO-15d also refers to another document, Society of Automotive Engineers (SAE) Aerospace Material Specification (AMS) 3806D, which details properties a fabric must contain to be an approved fabric for airplane cloth. Lighter weight fabrics typically adhere to the specifications in TSO-C14b, which refers to SAE AMS 3804C. 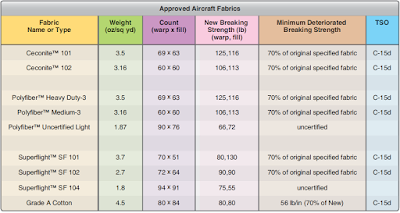 When a company is approved to manufacture or sell an approved aviation fabric, it applies for and receives a Parts Manufacturing Approval (PMA). 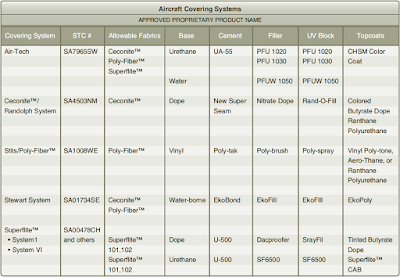 Currently, only a few approved fabrics are used for aircraft coverings, such as the polyester fabrics Ceconite™, Stits/Polyfiber™, and Superflite™. 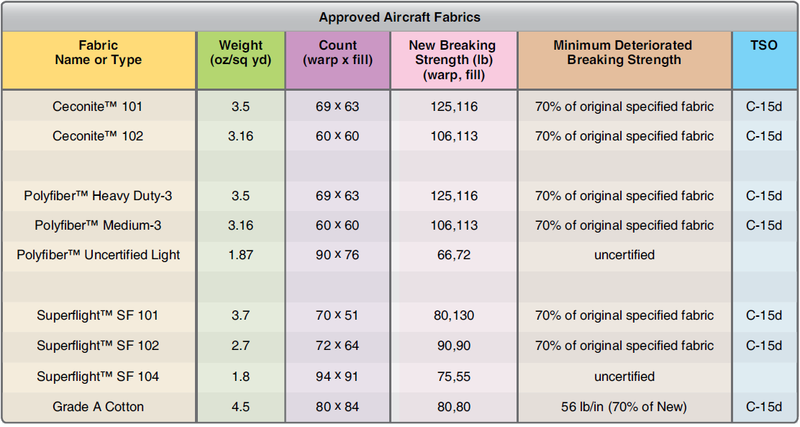 These fabrics and some of their characteristics are shown in Figure 1. The holders of the PMA for these fabrics have also developed and gained approval for the various tapes, chords, threads, and liquids that are used in the covering process. These approved materials, along with the procedures for using them, constitute the STCs for each particular fabric covering process. Only the approved materials can be used. Substitution of other materials is forbidden and results in the aircraft being unairworthy. The following is an introduction to the supplemental materials used to complete a fabric covering job per manufacturer’s instruction or a STC. 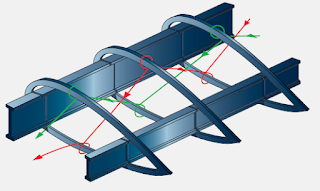 Rib bracing tape is used on wing ribs before the fabric is installed. It is applied spanwise and alternately wrapped around a top rib cap and then a bottom rib cap progressing from rib to rib until all are braced. [Figure 2] Lacing the ribs in this manner holds them in the proper place and alignment during the covering process. Surface tape, made of polyester material and often pre- shrunk, is obtained from the STC holder. This tape, also known as finishing tape, is applied after the fabric is installed. It is used over seams, ribs, patches, and edges. Surface tape can have straight or pinked edges and comes in various widths. For curved surfaces, bias cut tape is available, which allows the tape to be shaped around a radius. Rib lacing cord is used to lace the fabric to the wing ribs. It must be strong and applied as directed to safely transfer in-flight loads from the fabric to the ribs. Rib lacing cord is available in a round or flat cross-section. The round cord is easier to use than the flat lacing, but if installed properly, the flat lacing results in a smoother finish over the ribs. Sewing of polyester fabric is rare and mostly limited to the creation of prefitted envelopes used in the envelope method covering process. When a fabric seam must be made with no structure underneath it, a sewn seam could be used. Polyester threads of various specifications are used on polyester fabric. Different thread is specified for hand sewing versus machine sewing. For hand sewing, the thread is typically a three-ply, uncoated polyester thread with a 15-pound tensile strength. Machine thread is typically four-ply polyester with a 10- pound tensile strength. Each fabric covering job involves a method of attaching the fabric to wing and empennage ribs. The original manufacturer’s method of fastening should be used. In addition to lacing the fabric to the ribs with approved rib lacing cord, special clips, screws, and rivets are employed on some aircraft. [Figure 3] The first step in using any of these fasteners is to inspect the holes into which they fit. Worn holes may have to be enlarged or re-drilled according to the manufacturer’s instructions. Use of approved fasteners is mandatory. Use of unapproved fasteners can render the covering job unairworthy if substituted. Screws and rivets often incorporate the use of a plastic or aluminum washer. All fasteners and rib lacing are covered with finishing tape once installed to provide a smooth finish and airflow. Grommets are used to create reinforced drain holes in the aircraft fabric. Usually made of aluminum or plastic, they are glued or doped into place on the fabric surface. Once secured, a hole is created in the fabric through the center of the grommet. Often, this is done with a hot soldering pencil that also heat seals the fabric edge to prevent raveling. Seaplane grommets have a shield over the drain hole to prevent splashed water from entering the interior of the covered structure and to assist in siphoning out any water from within. [Figure 4] Drain holes using these grommets must be made before the grommets are put in place. Note that some drain holes do not require grommets if they are made through two layers of fabric. The structure underneath an aircraft covering must be inspected periodically. To facilitate this in fabric-covered aircraft, inspection rings are glued or doped to the fabric. They provide a stable rim around an area of fabric that can be cut to allow viewing of the structure underneath. The fabric remains uncut until an inspection is desired. The rings are typically plastic or aluminum with an approximately three- inch inside diameter. Spring clip metal panel covers can be fitted to close the area once the fabric inside the inspection ring has been cut for access. [Figure 5] The location of the inspection rings are specified by the manufacturer. Additional rings are sometimes added to permit access to important areas that may not have been fitted originally with inspection access. The airframe structure of a fabric covered aircraft must be cleaned, inspected, and prepared before the fabric covering process begins. The final preparation procedure involves priming the structure with a treatment that works with the adhesive and first coats of fabric sealant that are to be utilized. Each STC specifies which primers, or if a wood structure, which varnishes are suitable. Most often, two-part epoxy primers are used on metal structure and two-part epoxy varnishes are used on wood structure. Utilize the primer specified by the manufacturer’s or STC’s instructions. Modern fabric covering systems utilize special fabric cement to attach the fabric to the airframe. There are various types of cement. [Figure 6] In addition to good adhesion qualities, flexibility, and long life, fabric cements must be compatible with the primer and the fabric sealer that are applied before and after the cement. After the fabric sealer is applied, a filler is used. It is sprayed on in a number of cross coats as required by the manufacturer or the fabric covering process STC. The filler contains solids or chemicals that are included to block UV light from reaching the fabric. Proper fill coating is critical because UV light is the single most destructive element that causes polyester fabric to deteriorate. Dope-based processes use butyrate dope fillers while other processes have their own proprietary formulas. When fillers and sealers are combined, they are known as fabric primers. Aluminum pastes and powders, formerly added to butyrate dope to provide the UV protection, have been replaced by premixed formulas. Once the aircraft fabric has been installed, sealed, and fill-coat protected, finishing or topcoats are applied to give the aircraft its final appearance. Colored butyrate dope is common in dope-based processes, but various polyurethane topcoats are also available. It is important to use the topcoat products and procedures specified in the applicable STC to complete an airworthy fabric re-covering job. The use of various additives is common at different stages when utilizing the above products. 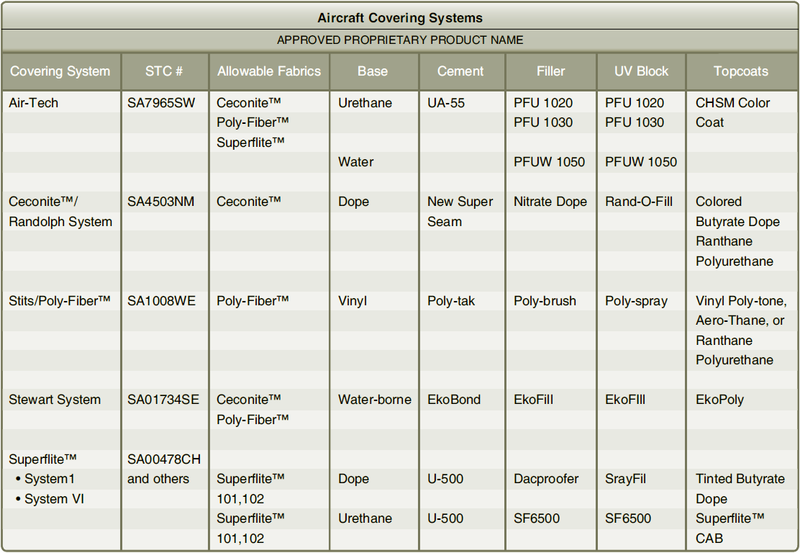 The following is a short list of additional products that facilitate the proper application of the fabric coatings. Note again that only products approved under a particular STC can be used. Substitution of similar products, even though they perform the same basic function, is not allowed. A catalysts accelerates a chemical reaction. Catalysts are specifically designed for each product with which they are mixed. They are commonly used with epoxies and polyurethanes. A thinner is a solvent or mixture of solvents added to a product to give it the proper consistency for application, such as when spraying or brushing. A retarder is added to a product to slow drying time. Used mostly in dope processes and topcoats, a retarder allow more time for a sprayed coating to flow and level, resulting in a deeper, glossier finish. It is used when the working temperature is elevated slightly above the ideal temperature for a product. It also can be used to prevent blushing of a dope finish when high humidity conditions exist. An accelerators contains solvents that speed up the drying time of the product with which it is mixed. It is typically used when the application working temperature is below that of the ideal working temperature. It can also be used for faster drying when airborne contaminants threaten a coating finish. Rejuvenator, used on dope finishes only, contains solvents that soften coatings and allow them to flow slightly. Rejuvenator also contains fresh plasticizers that mix into the original coatings. This increases the overall flexibility and life of the coatings. Fungicide and mildewicide additives are important for organic fabric covered aircraft because fabrics, such as cotton and linen, are hosts for fungus and mildew. Since fungus and mildew are not concerns when using polyester fabric, these additives are not required. Modern coating formulas contain premixed anti-fungal agents, providing sufficient insurance against the problem of fungus or mildew.